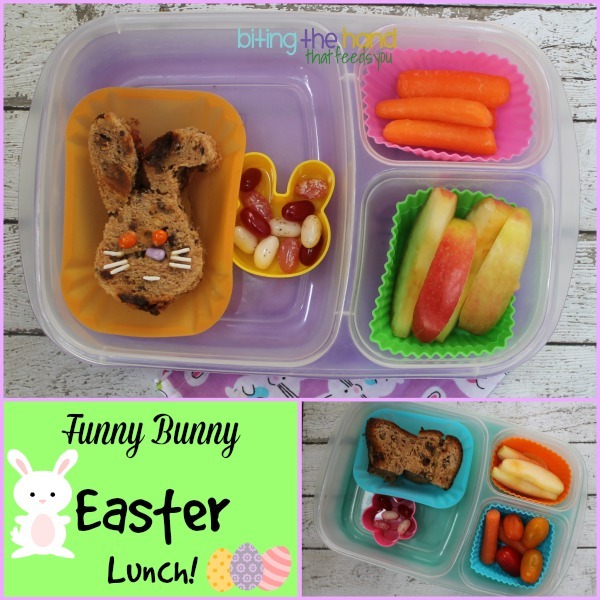 Biting The Hand That Feeds You: Easy Funny Bunny Lunch! Tuesday, 4/15/14 - I didn't have a lot of time or any cool ideas planned, but wanted to squeeze in at least one more Easter-y lunch before Easter weekend. So I rooted through a cheap plastic Easter cutter set I got at Target until I found a fun shape small enough to fit on gluten-free bread. For my Kindergartener, I just used a bunny head cutter and "glued" on some dye-free candy-coated sunflower seeds and white jimmies with extra Sunbutter to make a very rudimentary face. It isn't perfect, but I got it done within my time limit with a clingy sick toddler hanging off of me (jelly beans may have been involved in buying some "breathing room"...) I included some dye-free (Valentine's clearance!) jelly-beans as the Easter Bunny's eggs, and put them in a mini silicone bunny cup. She hasn't normally liked Sunbutter, but I keep it on hand since I prefer it to PB in most things (except sandwiches ironically.) 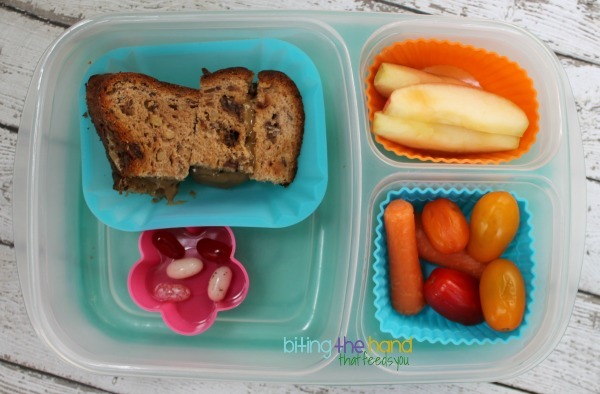 But since Z had gobbled down the Sunbutter-jelly sandwich she packed when I did a lunch class with her class, I thought maybe it was jelly that was the key to helping her like it (Sunbutter-honey and Sunbutter-Ricemallow sandwich combinations have both been rejected in the past.) But no. She was a fan of the candies and sprinkles though. 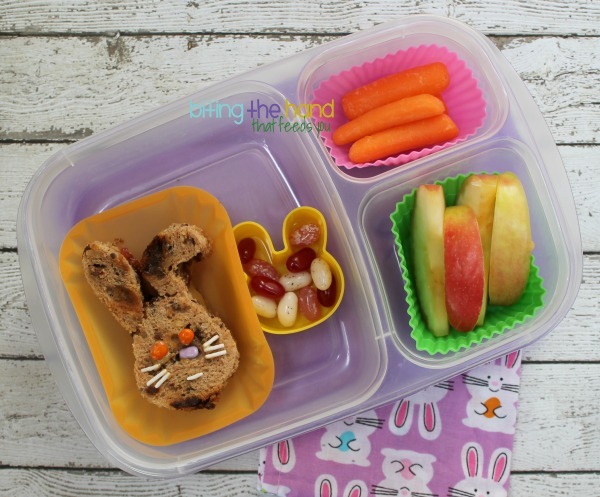 The cute Easter napkin came from Beneficial Bento on etsy. I didn't bother making the toddler's lunch cute since she'd been sick for the previous few days and ate hardly anything. She ate virtually nothing from this lunch either, but somehow managed to muster up enough appetite to down all the jelly beans in her mini silicone flower cup. What a shock.